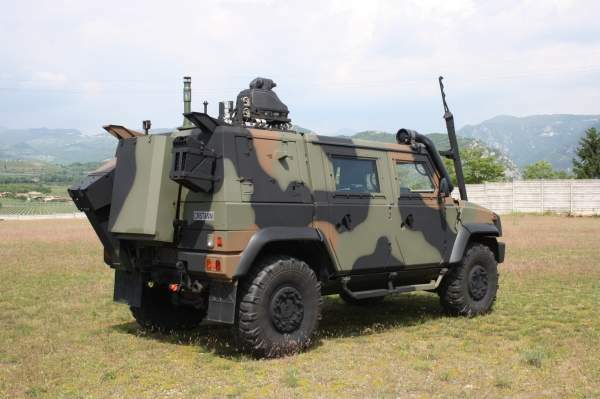 Cristanini provides chemical, biological, radiological and nuclear (CBRN) decontamination solutions for military equipment, personnel, infrastructure, and terrain, serving a worldwide client base. Our core system is based on the Sanijet C.921, the Sanijetgun and the BX24 universal decontaminant. 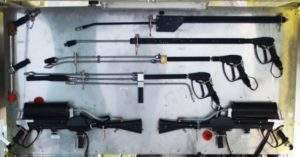 We provide multiple solutions for decontamination operations: CBRN trailers, shelters, containers and the 21st century Thorough Decontamination System (TDS 21 formerly DDMAS). 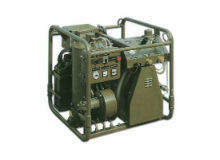 In the past, Cristanini has configured hazard management solutions for nuclear power plants, critical national infrastructure, special forces and CBRN EOD units along with a range of personnel decontamination systems. We provide man-portable CBRN decontamination systems (PSDS10 MIL, PRNDS12 MIL and PSDS 1.5 MIL), as well as decontamination solutions for internal infrastructure (LVD-X) and mission-essential sensitive equipment (SX34). We also deliver environmental waste management solutions. 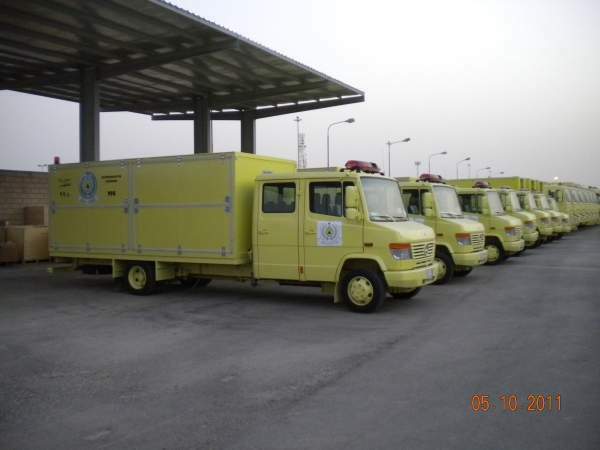 Other products include the supply of cistern cleaning and de-gassing equipment, specialist water-jet steel cutting and fire-fighting equipment, several mobile laboratory options for CBRNE forensics-level analysis and a CBRN reconnaissance, survey and scene assessment vehicle. The Cristanini Sanijet decontamination system offers huge advantages: low training and operator burden, improved speed, a reduction in physiological and psychological burden, a decrease in man-hours, a lesser logistical footprint in terms of weight and volume for storage, transportation and at the decontamination site, and substantial savings in personnel costs. The Sanijet C.921 system has three pistons, providing less vibration, greater stability and longevity and impressive maintenance intervals. It is extremely robust and simple to operate. 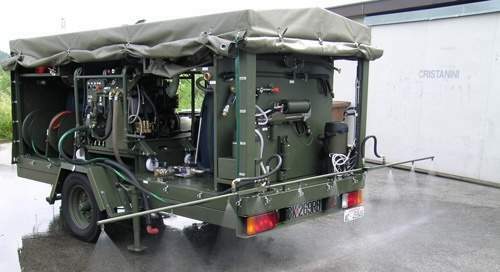 The C.921 is able to conduct all phases of decontamination operations – no other machines are required. Just as a soldier will adjust the safety catch on his weapon from single shot to automatic fire, the Sanijetgun decontamination lance operator can adjust the application from low-pressure water, to the application of BX24 decontaminant and then low or high-pressure rinse. Cristanini’s principal decontaminant and detoxificant is BX24 – the most efficient, multi-functional, environmentally friendly and non-corrosive detoxifying agent on the market, neutralising both chemical and biological agents while polarising radiological particulate. BX24 also has a preventive contamination and sanitisation role. BX29 is used for decontaminating people with its shampoo-like formulation. BX30 is a BX24 simulant that adds realism to training. Its benign properties also assist in the reduction of volatile chemical vapour. BX40 is a foamy product for the decontamination of aircraft frames, and is also effective in decontaminating radiological particulate.SX34 is the only effective non-aqueous solution for the decontamination of sensitive equipment. 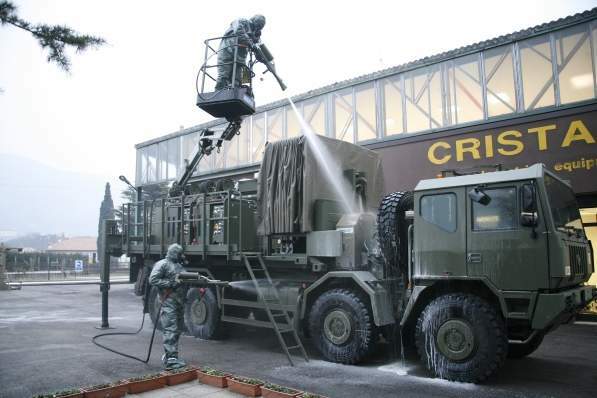 The PSDS10 MIL decontamination system contains the universal decontaminant BX24 and offers a wide range of decontamination solutions: vehicle decontamination, decontaminating personnel wearing CBRN IPE, small-scale release and sanitisation. 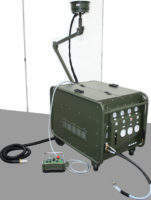 PRNDS12 MIL permits small-scale use of the decontaminant BX40, which is optimised for the decontamination of radiological particulate and airframes. The PDSD1.5 MIL decontamination system also permits the handheld application of the universal decontaminant BX24 on fully-protected personnel, equipment and small-scale isolated incidents. SX34 has an easy, ready-to-use application. When applied directly to sensitive surfaces, it immediately contracts and absorbs the contaminant, and then solidifies to form a white powder which is suctioned into the vacuum receptacle. Chemical or biological agents are then neutralised by BX24, and radiological material is contained for disposal. There is no chemical or thermal reaction, just the mechanical removal of the contaminant. The RSSA has three crew members, COLPRO and air-conditioning, and is equipped with CBR detectors, meteorological measurement, CCTV and GPS. It conducts, photographs, retains and disseminates data relating to the sampling of asphalt, earth, sand and liquid hazards. Samples are retained for further analysis. Dissemination is in accordance with NATO ATP 45-D. A battle-proven platform provides ballistic protection. RSSA can be customised for homeland security and civil protection missions. Cristanini manufactures easily transportable, containerised CBRNE laboratories that can be shipped by land, sea, and air. 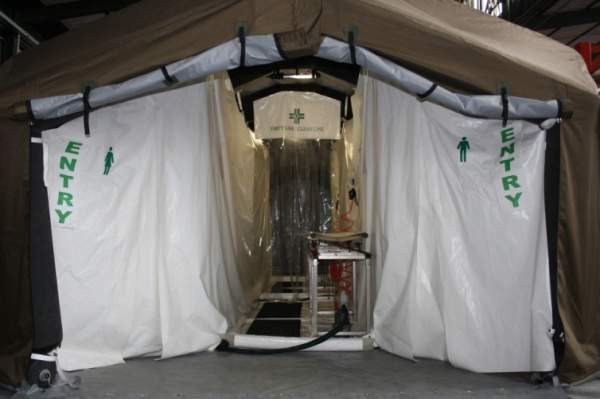 Each laboratory is self-sufficient for consumables and life support for 72 hours in a contaminated area, with CBRN filtration, air conditioning and a separate but integrated pressurised ‘shower room’ that ensures crew decontamination. Our vehicle-mounted VIRE CBRN laboratory supports emergency responders and performs initial detection and identification quickly to enhance safety and consequence management. Cristanini is a highly-committed and innovative company that invests heavily in research and development and produces a wide range of niche equipment. Other products include personnel CBRN decontamination for major CBRN incidents as well as niche capabilities for special forces, CBRN EOD and diving in contaminated water. The company delivers chemical and biological decontamination of the air and interior surfaces ranging from critical national infrastructure and VVIP suites, to civil or military aircraft, to C2 centres and underground systems. Cristanini also provides cistern decontamination and degassing, and the sterilisation of potable water containers. We have a wide range of environmental waste management options based on decontamination, containment and disposal, and innovative solutions for fighting fires and toxic fumes. Finally, Cristanini places huge emphasis on reducing the training, operating and logistic burden on the individual and on the provision of through life-cycle support for its customers. During past decades, requirements for CBRN Protection have changed drastically. Nowadays, not only are rogue states threatening the world with potential catastrophic consequences, but terrorist cells and individuals also have capabilities to attack our society. This white paper showcases the best solutions for CBRN decontamination and detoxification. The heart of Cristanini's decontamination system is the Sanijet C. 921 decontamination and detoxification system. The innovative Cristanini Large Decon Volume System, named LDV-X, has been developed specifically for indoor decon volume mission. 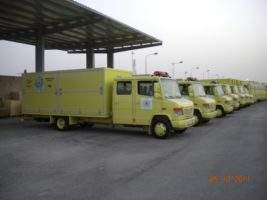 The spread of Ebola in West Africa and the emergence of isolated cases in Western and other countries has caused widespread alarm. Cristanini has closely followed the emergency, being a supplier of decontamination systems, but not before considering potential equipment solutions. Cristanini has released a white paper showcasing the best solutions for CBRN decontamination and detoxification.